Even though materiality is a critical principle in a context of companies increasingly embracing Integrated Reporting (IR), the link between companies’ IR orientation and their disclosure about their materiality determination process (MDP) is still under-investigated. Starting from this consideration, the chapter contributes to the empirical branch of IR research focusing on materiality in IR contexts. This study aims to verify to what extent companies’ IR orientation is associated with their attitude toward disclosing information about their MDP. To this aim, we analysed websites and reports of 108 European top companies included in the 2016 RobecoSAM Sustainability Yearbook. After the selection of two sets of predictors—i.e. regarding respectively IR orientation and MDP disclosure—the z-scores of the extracted principal components for each set were tested with Chi Square and Cramer’s V associations. Although the analysis returned interesting results for IR (e.g. 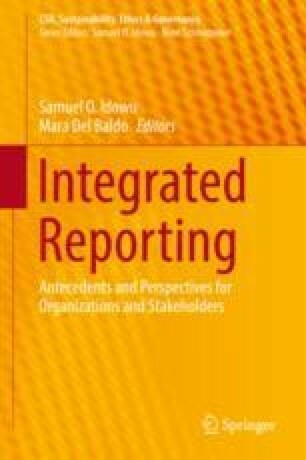 the prominence of sustainability-based reporting) and MDP (e.g. generalised lack of materiality in tables of contents) as well as on variables not associated, the most striking result is the unexpected very weak connection between IR orientation and MDP disclosure attitude. Both these results and the study’s limitations suggest further research on the evolution of the link addressed. Tiziana De Cristofaro wrote Sects. 14.1, 14.2.2, 14.3, 14.4.2, 14.5.2, 14.5.3 and 14.6 and Carmela Gulluscio wrote Sects. 14.2.1, 14.4.1, 14.5.1 and the introduction to Sects. 14.2 and 14.5. The authors are grateful to Eugenia Nissi, associate professor of statistics at the University of Chieti-Pescara (Italy), for her support with the statistical analysis.